Processes, Services, Installations: One UI to rule them all. Almost. An attempt to cure the headache of a Windows 10 desktop festooned with Linux distributions has arrived in the form of WSLTools from Opsview. Developed in conjunction with Canonical, the Windows Subsystem for Linux (WSL) was originally somewhat of a curiosity when it debuted as part of the Windows 10 Anniversary Update (aka 1607.) Consisting of what is effectively a compatibility layer, translating Linux system calls into something Windows 10 understands, WSL initially shipped with a version of Ubuntu running the Bash shell. Microsoft has been serious about the technology, and over subsequent Windows 10 versions added more capability and introduced the ability to download alternative distributions from the Microsoft Store. The likes of Debian and SUSE can now be swiftly spun up using the WSL. The ability to launch multiple sessions of multiple distros on the same desktop has definite appeal. However, managing the things quickly becomes a headache. IT monitoring outfit, Opsview, has therefore emitted a free dashboard, WSLTools, to allow users see what their WSL sessions are actually up to, and manage the distributions without having to leap around the Windows 10 UI like a lost mountain goat. Always keen for an excuse to fire up WSL in Windows 10, The Register took WSLTools out for a spin to see how it worked. And the answer is… sort of. Opsview is at pains to point out that this is a public beta, so some rough edges can be forgiven. However, starting the thing up after downloading the Windows binaries can be a bit of a head scratcher, since the UI insists on starting in a minimised state. Once in, the application aims to provide a single place from where a WSL fan can add new distros (Opsview have yet to work out how to scrape the Microsoft Store for new distros, so the list is very much hardcoded at present.) Distros can also be uninstalled and reset without needing to hunt around Windows 10 for the relevant options. Nice. Arguably more useful is the process list for each distribution, showing (to our untrained eye) what typing top does in Bash, replete with CPU utilisation and memory consumption and a handy End Task button to kill off errant commands. The Services list does exactly what its name suggests, although is read-only at this stage. 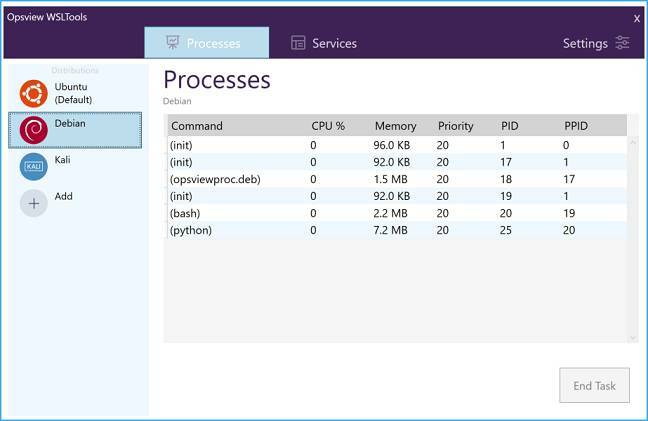 Bill Bauman, head of innovation and product strategy at Opsview told El Reg that the goal was to create something like the Windows Task Manager, except for the WSL, while avoiding the overhead of having to scrape the output of a command such as top. Unfortunately there is no option to log or view historical statistics, which is a shame. Bauman admitted: “Nobody has asked specifically for it”, but the Opsview team are keen for feedback on the beta to add additional functionality. Upcoming toys being considered are the ability to launch distributions from a specific directory as well as a user and file manager for WSL. While Windows 10’s file explorer can theoretically do some manipulation of the WSL file system, it is a little too easy to break a directory structure thanks to a carelessly created folder. The code itself is currently closed source, although Bauman is open to the idea of opening it up should there be sufficient interest. Microsoft has also taken note of the product; Bauman said that the WSL team “really like it”. With the Windows 10 Task Manager paying lip service to WSL (yes, you can track down the WSL processes and work out which distro they belong to, but it is a pain) the enthusiasm of the WSL team is understandable.